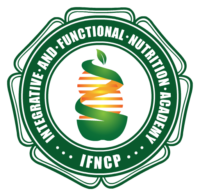 A couple years out of college, I visited a dietitian to learn how to slim down and eat healthfully on a vegetarian diet. She immediately cut out my soda consumption – I had been drinking a Coke with meals everyday since I was a child. I never liked the taste of diet soda so I was really at a loss as to what to drink with meals. Living in New York, I soon discovered and fell head over heels in love with the ubiquitous seltzer water AKA fizzy water, soda water, Perrier if you are in France, San Pellegrino if you are in Italy, and as I came to refer it as a Californian, sparkling water. Simply put, carbonated water saved my life! It has the mouth feel of the soda I grew up drinking made so much better with fresh lemon, lime or other fruit to give it a spectacularly refreshing and all natural taste. No added sugar, artificial flavors or colors, or caffeine needed here folks! I was buying fizzy water by the jugfuls for years. SodaStream is an Israeli company with its main factory in the largest Israeli Jewish settlement in the West Bank. For over 40 years, Israel has occupied the West Bank, Gaza Strip, and East Jerusalem with the Israeli military having total authority over every aspect of Palestinian life in these areas. Numerous human rights organizations, including Amnesty International, have condemned the Occupation for violating international humanitarian law and Palestinians’ human rights through the construction of hundreds of illegal settlements. SodaStream built its factory in the settlement in order to receive financial incentives from the Israeli government yet Palestinian workers in the settlements do not enjoy the full protection of Israeli labor laws including fair wages and other state benefits that their Israeli co-workers enjoy. [As such], many people view buying products such as SodaStream that are manufactured in the settlements as contributing to sustaining the settlements, and why a number of organizations, Meretz USA, Americans for Peace Now, and Jewish Voice for Peace, as well as the Presbyterian and Methodist churches, have endorsed a boycott of SodaStream and other products made in the illegal settlements. Here’s more on the SodaStream backlash as reported in the Huffington Post. As a self-proclaimed food politician and health food advocate, I believe in the power consumers have to vote with our almighty dollar. As such, I want to know where my the products I purchase come from and who’s behind the brands I choose to support. I’m also a social justice advocate and decided to join the SodaStream boycott by literally tossing it in the trash. I feel badly that it will likely land in a landfill. Am I missing my fizzy water you ask? Not since I’ve discovered the art and science of cold brewed herbal tea. Rooibos, also known as South African red bush, is my absolute favorite for its refreshing, superb flavor. As it is an herb and not actual tea, It contains very little tannin so its smooth vs bitter and is naturally 100% caffeine-free. It also contains Vitamin C as well as other antioxidants so drinking it naturally brewed in filter water makes it an ideal beverage to enjoy with meals or alone. 1) Cold-brewed teas taste sweet and smooth. This is because cold water extracts a different chemical balance from the tea than hot water. 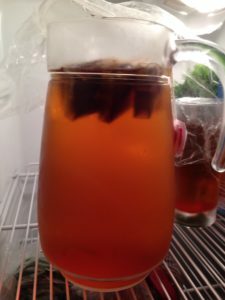 Cold tea brewing helps reduce a tea’s tannins and caffeine (if brewing real tea), reducing any bitterness. 2) It’s cold and doesn’t require heat to make, saving energy. 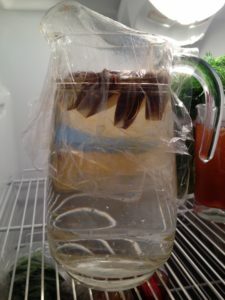 3) Cold brewing is a new way to enjoy old favorites. Cold brewing can shift a tea’s flavor profile in a new way and experimenting with your favorite tea can be fun. processing (thus they may harbor bacteria) and aged pu-erhs may have collected some dust over the years. 5) Cold brewed tea is so easy to make! • Let it sit in the fridge for four to ten hours, depending on the type (less time for white and green teas and more for herbal infusions and black teas). • Strain loose tea if needed. 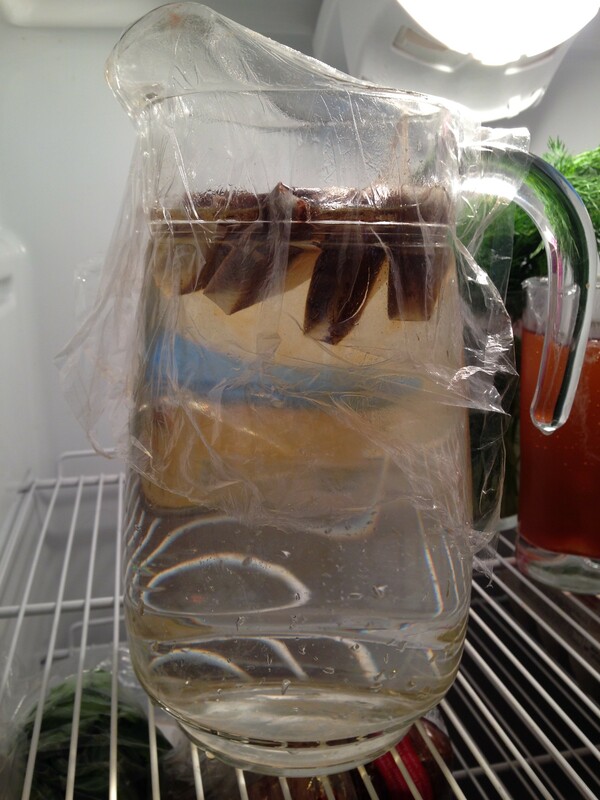 I usually leave my herbal tea bags in the pitcher until all the tea is consumed. So there you have it – Cold brewed herbal tea is SO MUCH better than soda or seltzer! It’s naturally calorie-free, economical, deliciously refreshing and without controversy. Great article! I have used a SodaStream off and on for years – but no more! What Rooibos tea bag brand do you use?